After corruption in MS Server, the steps for Exchange Recovery becomes very self-explanatory for all exchange users through this cutting-edge technology SysInspire Free Exchange Recovery Software that has achieved lots of prominence in the event of Exchange EDB File Recovery & Exchange Mailbox Recovery to PST outlook file. Software supports to recover private folders & public mailboxes folders in order to restore exchange to PST, MSG, HTML, EMLX & EML format with preserve each and every data integrity. Auto detects .edb location, deeply scans file to load preview of EDB emails, calendars, task, notes, journals etc. Best software for Exchange mailbox recovery & Exchange email recovery with extract emails meta properties- to, bcc, cc, time, subjects and from. Mail filtering option enable for Exchange Email Recovery by define and filtering dates “from date” to “to date”. Provision of splitting the recovered PST file by define size upto 5GB. Recover complete mailbox component like- emails, calendars, task, notes, journals, meeting and etc. Demo version software converts 25 items from each folder into each formats. 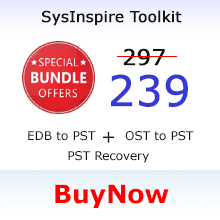 SysInspire Exchange EDB File Recovery Software has enriched features which makes it different from another third party online solution; users can download Free Exchange Recovery Software and repair corrupted exchange file to recover exchange mailbox to PST. Software will create Unicode characters PST File that can access on all MS outlook versions like- 97, 2000, 2002, 2003, 2007, 2010, 2013 & 2016 (32 and 64 bit) during Exchange Email Recovery to PST process. Exchange EDB File Recovery Software capable to perform batch folders conversion of EDB File along with all attachments & emails attributes. 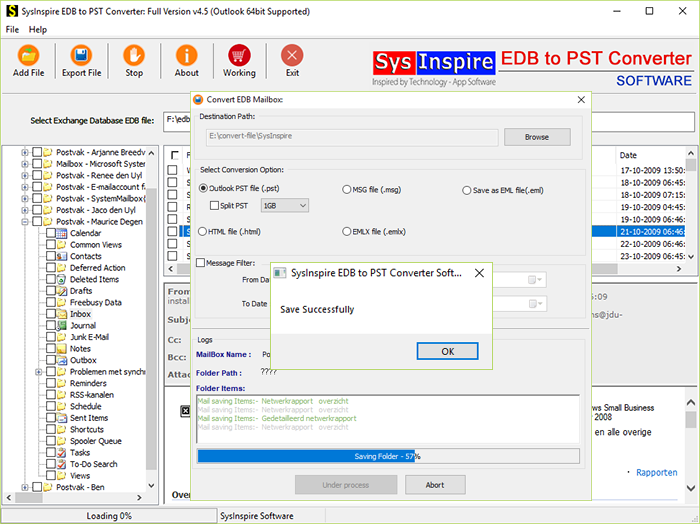 Free Exchange Mailbox Recovery Software of SysInspire makes use of best scanning algorithm to remove all errors and for exchange edb file recovery to PST file. Software capable to recover each items of exchange file like- emails, contacts, calendars, task, notes and journals etc. Free Exchange Recovery Software start recovery of selective folders and complete folders of your exchange database to PST, MSG, EML, HTML and EMLX format. Recovery emails from dis-mounted, corrupted exchange file using this Exchange Email Recovery Software that supports all exchange server versions- 2016, 2013 and below version to recover emails from all mailbox folders like- contacts folders, calendars folders, deleted folders emails etc. The good thing in the software it maintains emails formatting, emails header information & attachments attributes while recover exchange EDB file to PST file. Free Exchange Recovery Software is grabbing such a brilliant feature that is recover Unicode exchange file & also supports for recovery of multilingual exchange file (non- English characters) without altering data. Exchange EDB File Recovery Software keep all folders structure unchanged and set aim to remove incompatibilities for users during recovery time. This can be understood sometime there is no requirement of recovery complete mailboxes items after corruption only there need of recovery needed mailboxes folders so specially for this type of situation our Free Exchange Recovery software is well suited because it offers facility users can make selection of the mailbox folders and their emails and convert selected items into PST outlook file, MSG and another format with maintains data integrity. Exchange Recovery Software deeply scans EDB file and take out all types of corruption issues only to makes your exchange file again readable format by recovery of exchange mailboxes emails to PST file. Exchange EDB File Recovery Software let users recover exchange mailbox to PST & MSG format that can import in MS Outlook application support any versions included- 97, 2000, 2002, 2003, 2007, 2010, 2013 and 2016. This is well known larger PST file can be cause of outlook corruption so now users can prevent their PST File from its 2 GB corruption by choosing this optional PST Split feature of the Exchange Recovery Software that is FREE for using. Users can choose the size from 1 GB to 5 GB to makes PST file small in size and can create single PST File for saving all exchange file recovered data with preserve each its records without problem. Filtering emails message by dates selection is one of the advanced and new feature of Exchange Recovery Software that allows users define dates “from date” to “to date” to recover exchange emails along with attachments items with preserve each emails formatting, meta title, emails header icon and embadded images etc. This feature of software saves precious time of users by providing opportunity to recover emails of specified period. 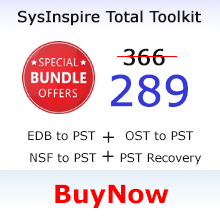 SysInspire Free Exchange Recovery Software repair all corrupted EDB file and recover exchange file to PST Outlook file with preview of mailbox items- emails, calendars, send items, attachments, calendars entries, contacts and etc. The previewing feature of the exchange mailbox recovery software makes users capable to know about what items of EDB file are going to convert into PST, EML, MSG, EMLX and HTML format. 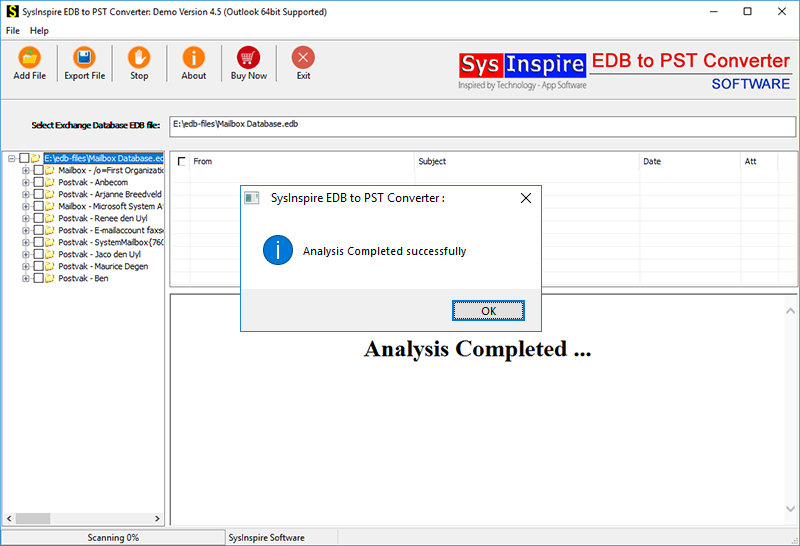 Supoprted EDB Version: SysInspire Exchange Recovery & conversion Software supports to recover exchange database EDB 2016, 2013, 2010, 2007, 2003 and 2000 files. 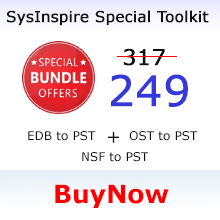 How suitable can be the demo version of SysInspire Exchange Recovery Software? SysInspire demo Exchange Recovery Software allows you to know the trustworthiness of the software like- how it perform recover exchange mailbox to PST file. 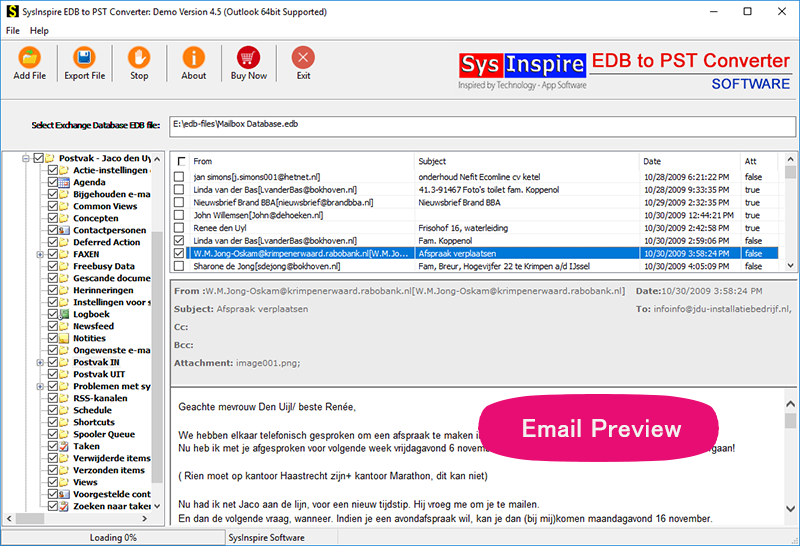 Demo supports scanning of damaged EDB file and let you preview of complete recovered exchange items. You can also restore 25 emails per folders into every format at free of cost but for restoring complete database here you must purchase full version of the exchange email recovery software. How can I recover exchange file if I don’t have idea about .edb location? You can choose “Auto Search” option of the Exchange EDB File Recovery Software to locate an .edb file for exchange email recovery. 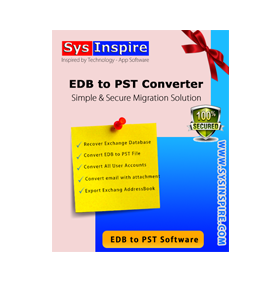 Software automatically detects .edb location and perform fast exchange recovery to PST performance. Is it possible to recover private and public folder to PST by Exchange EDB File Recovery Software? Yes, this Free Exchange Recovery Software is capable to recover mailbox from Private and public exchange server to PST Outlook file. Does Exchange Recovery Software require MS Outlook Installation? Yes, the Exchange EDB File Recovery Software is required MS Outlook installation to recover exchange EDB file to PST and MSG format. Do I need to have Live Exchange Server environment to use software for recover exchange mailbox to PST File? No, live exchange server environment is not necessary to recover exchange mailbox to PST file. I can fairly say I loved this Exchange Recovery Software. This application not only worth its cost but also have best feature like- splitting PST, messages filtering, selective folders conversion and so on. I liked its live preview facility that gave me hint of every email which was going to recovered thanks a lot I am giving 5/5 rating to the software. I would like to suggest all Exchange Administrators to try this best SysInspire Exchange Mailbox Recovery Software because it ensures seamless data recovery from damaged and corrupted Exchange EDB file to healthy PST File. I rate the software 9.7 on a scale of 10! Thanks a lot for providing this best Exchange Recovery Software.